Three things stand between you and your children - a jungle teeming with danger, the ruins of an ancient Mayan tribe, and a band of thugs - and you're not going to let any of them stop you! 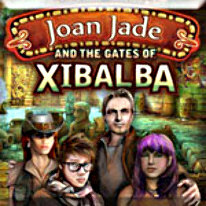 Assume the role of Joan Jade, archeologist of the year and mother extraordinaire, as she searches for hidden objects, solves mind-melting puzzles, and beats one ingenious mini-game after another. Along the way, you'll visit dozens of beautifully crafted locations and uncover a story of nail-biting suspense.